Blueberries, minerals, dried herbs and spices on the nose follow through to a full to medium body with a fantastic linear palate that gives the wine super energy and harmony. Goes on for minutes. Lots of black licorice and stones at the end. 95% cabernet sauvignon with hints of merlot, malbec and petit verdot. Better in 2019. The velvety approachability of this soft, supple wine belies a strength and sophistication always at the heart of this producer’s wines, an intensity of flavor and power that commands attention. Black currant, black cherry, sage and smoky oak ride atop an underground of black pepper, combining ultimately into a tantalizingly juicy package. Drink now through 2023. Cellar Selection. The 2013 Cabernet Sauvignon One Point Five shows just how compelling this vintage is, even among mid-tier offerings. Dark, ample and structured to the core, the One Point Five boasts superb concentration, power and depth. Blackberry jam, gravel, smoke, licorice and savory herbs build to the vibrant, intense finish. This is an impressive showing from the One Point Five. The finely ripened tannins of this wine show off the greatness of the 2013 vintage, their chocolate richness detailed in layers that give the wine a Stags Leap District signature. The fruit fills those layers with dark raspberry scents, floral notes and savory elements – what Gretchen Buck of SF’s Absinthe described as the lifted scent of fresh bay leaves. 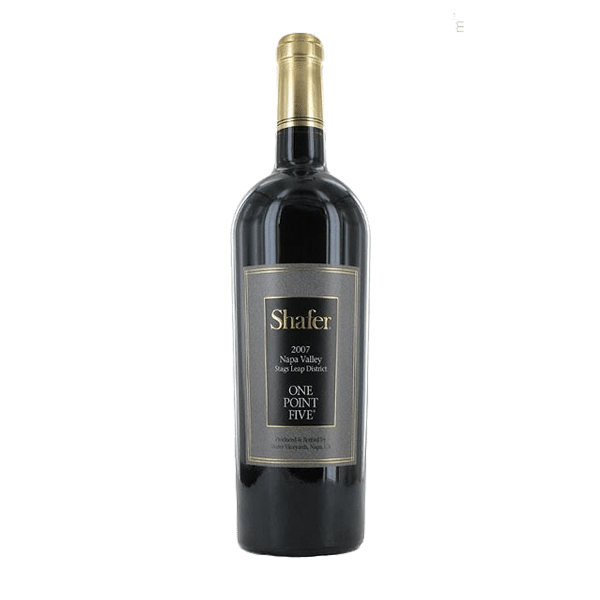 The Shafers blend this wine from their home vineyard, on a series of volcanic, dome-shaped hills nestled under the Stags Leap escarpment, including fruit from their Borderline Vineyard, two miles south. At 15.3 percent alcohol, this is bold, but it’s balanced, notably fine and approachable for its size.